Bring a touch of rustic charm to your space with the Pearl Mantels Shenandoah Traditional Fireplace Mantel Shelf. The natural beauty of the wood grain is emphasized with hand-hewn edges and splits. This mantel shelf can be hung with or without corbels, which are packed separately. Available in your choice of finish and length. Note: This mantel's hand-hewn edges and splits enhance the beauty of the shelf making each piece unique. Finishes and distressed markings may vary slightly from images. Dimensions: 24 in. option measures: (With Corbels)-24L x 8W x 8.25H in. , (Without Corbels)-24L x 8W x 4.5H in. 36 in. option measures: (With Corbels)-36L x 8W x 8.25H in. ,(Without Corbels)-36L x 8W x 4.5H in. 48 in. option measures: (With Corbels)-48L x 9W x 10.5H in. , (Without Corbels)-48L x 9W x 5H in. 60 in. option measures: (With Corbels)-60L x 9W x 10.5H in. , (Without Corbels)-60L x 9W x 5H in. 72 in. option measures: (With Corbels)-72L x 9W x 10.5H in. , (Without Corbels)-72L x 9W x 5H in. About the Pearl Inlay Pearl Mantels is now including a discrete, authentic inlaid pearl on each of their pieces as a certificate of authenticity. During the transition, your Pearl Mantel may or may not include this feature. Please contact our Customer Care Center with any questions. Pearl Mantels Inc. believes in business based on honest value, quality products, and personal service - even contacting clients directly to evaluate their needs and develop leading-edge solutions. Pearl also believes mantels are the emotional core of rooms, representing heritage and tradition and displaying precious heirlooms. 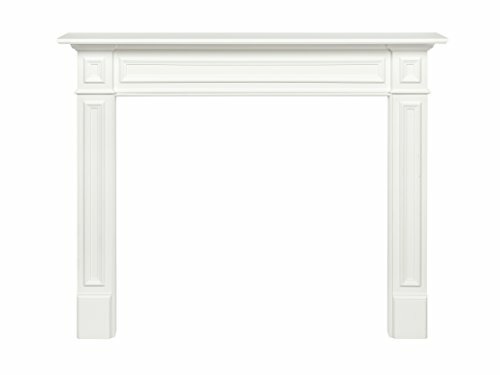 Each Pearl mantel boasts detail and classic design, all at an affordable price. 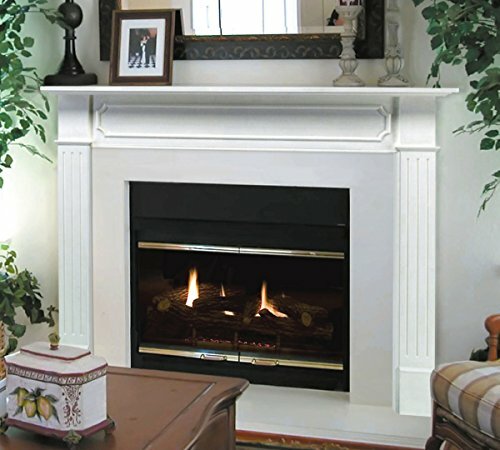 Plus a variety of finish options ensures Pearl Mantels Inc. indeed has a mantel for every hearth. Durable, lovely pine mantel shelf. Your choice of finish and length. Hand-hewn edges and splits. Can be hung with or without corbels. Signature pearl-style inlay. The Dogberry Collections Rustic Fireplace Mantel Shelf will make a bold statement about your design preferences. Made in the USA from planks of real Knotty Alder wood, this easy-to-install mantel also works as a floating shelf. Available in a variety of gorgeous finishes, including aged oak, dark chocolate, and silverwood. Available shelf lengths: 36, 48, 60, and 72 in.. 10 inch shelf depth perfect for clocks and other decorative accent items. Knotty Alder plank construction with playwood backing. Available finishes include aged oak, dark chocolate, and silverwood; machine-distressed. Suitable as wall-mouted mantel or floating shelf. Looks gorgeous mounted to a brick fireplace. Available shelf lengths: 36, 48, 60, and 72 in. It's the first piece of furniture in any home. There's nothing as warm and welcoming as a crackling fire in an open fireplace. The dancing flames can lift your spirits and melt away the most stressful day in a matter of minutes. But to truly be part of the home, a fireplace must warm our hearts even when there is no fire in the grate. Pearl does not treat the mantel as trim or molding but as a beautiful piece of furniture that is the focal point of the entire room, the emotional core. It represents roots, heritage and tradition. Furniture is arranged around it, precious treasures are displayed on it, and it provides balance and stability to the entire room. Pearl Mantels features fine furniture quality, stunning details and classic designs that will enhance any decor. 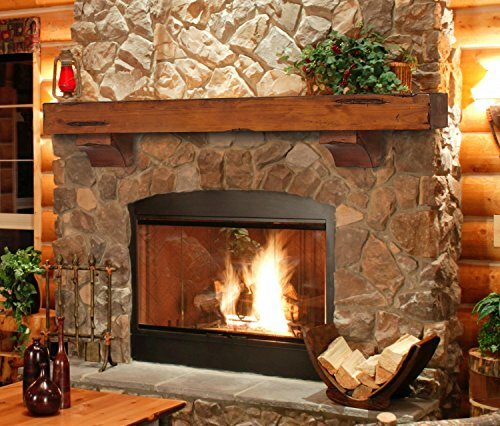 The Shenandoah has a charming frontier flavor that will create a rustic atmosphere for any room. Hand-hewn edges and distressing enhance the natural beauty of the wood grain. This pine mantel shelf arrives with a warm medium finish and may be hung with or without corbels, which are packed separately. Shelf Length: 72" Shelf Depth: 9" Overall Height with Corbels: 10 1/2" Overall Height without Corbels: 5" Height Corbels: 5 1/2" Width Corbels: 6 1/2" Width between Corbels: 42" Weight 38 pounds. Also available unfinished - paint and stain grade. 520-48 Features: -Full mantel surround MDF with white paint - out of the box and ready to hang.-Home improvements - millwork and trim.-Projection: 1.5".-Interior: 42" H x 48" W.-Outside Leg Base: 58" W.-Shelf: 62" W x 8" D. Includes: -3 Pieces simple nuts and bolts assembly mitered hanger board set up included for easy installation.-Mitered hanger board set up included for easy installation. Dimensions: -Overall Dimensions: 52" H x 62" W x 8" D, 54 lbs. Collection: -The Berkley collection. Warranty: -1 Year limited warranty. 418-72 Finish: Unfinished, Shelf Length: 72" Features: -Mitered hanger board assembly included for easy installation. -Wood paint and stain grade. -For use in any room. -Not just for the hearth. -Home improvements - millwork and trim. -The Homestead collection. Product Type: -Shelf mantel. Finish: -Unfinished. Primary Material: -Wood/Manufactured wood. Hearth Type: -Standard. Finish Antique - Distressed: -Yes. Dimensions: -Bottom width: 50". -Weight capacity has not been tested. Shelf Length 60" - Overall Height - Top to Bottom: -5". Shelf Length 60" - Overall Width - Side to Side: -60". Shelf Length 72" - Overall Width - Side to Side: -72". Shelf Length 72" - Overall Depth - Front to Back: -10". It s the first piece of furniture in any home. There's nothing as warm and welcoming as a crackling fire in an open fireplace. The dancing flames can lift your spirits and melt away the most stressful day in a matter of minutes. But to truly be part of the home, a fireplace must warm our hearts even when there is no fire in the grate. Pearl does not treat the mantel as trim or molding but as a beautiful piece of furniture that is the focal point of the entire room, the emotional core. It represents roots, heritage and tradition. Furniture is arranged around it, precious treasures are displayed on it, and it provides balance and stability to the entire room. Pearl Mantels features fine furniture quality, stunning details and classic designs that will enhance any decor. The Savannah s understated design is warm and welcoming. Graceful moldings wrap this Pine shelf to bring perfect balance to your room. The ash brown Taos finish is lightly distressed with burnished edges. Use over the hearth, in the bedroom, bathroom, kitchen, den or anywhere you need a little something extra for storage or treasures. Its uses are only limited by your imagination. This shelf is hollow in the back, giving the appearance of solid wood, without the weight. Mitered hanger boards are included for ease of hanging. Shelf Length: 60" Shelf Depth: 9" Bottom Base Depth: 6.5" Bottom Base Length: 55 Overall Height: 9" Weight 40 pounds. Look for the pearl inlay that graces the right hand side of the shelf as proof that you have received an authentic Pearl Mantel. Pearl Mantels features fine furniture quality, stunning details and classic designs that will enhance any decor. Also available unfinished. Shelf Length: 60 Shelf Depth: 9 Bottom Base Depth: 6.5 Bottom Base Length: 55 Overall Height: 9. 495-60 Finish: Unfinished, Shelf Length: 60" Features: -Mitered hanger board assembly included for easy installation. -Wood paint and stain grade. -For use in any room. -Not just for the hearth. -Home improvements - millwork and trim. -We suggest that pilot holes be drilled prior to inserting the appropriate hardware for final installation on the wall surface.. Product Type: -Shelf mantel. Primary Material: -Wood/Manufactured wood. Hearth Type: -Standard. Dimensions: Shelf Length 48" - Overall Height - Top to Bottom: -12". Shelf Length 48" - Overall Width - Side to Side: -48". Shelf Length 48" - Overall Depth - Front to Back: -9.5". Shelf Length 48" - Interior Surround Width: -31". Shelf Length 60" - Overall Height - Top to Bottom: -15". Shelf Length 60" - Overall Width - Side to Side: -60". Shelf Length 60" - Overall Depth - Front to Back: -10". Shelf Length 60" - Interior Surround Width: -40.5". Shelf Length 72" - Overall Height - Top to Bottom: -15". Shelf Length 72" - Overall Width - Side to Side: -72". Shelf Length 72" - Overall Depth - Front to Back: -10". Shelf Length 72" - Interior Surround Width: -52.5". These barnwood barn beam fireplace mantels are made from solid reclaimed pine barn beams, that were reclaimed from a 100+ year old barn in SE MN. They are available in 4x6, 6x6, 6x8, and 8x8. Each Barnwood mantel comes fully finished and ready to be installed The barnwood fireplace mantel you receive will not be the fireplace mantel pictured. 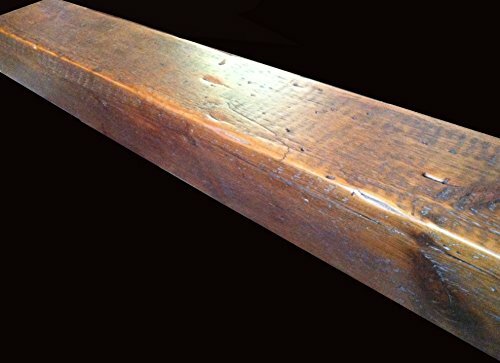 Each of these barn beam fireplace mantels are individually hand crafted from the same material pictured but each is piece has its own unique character marks. 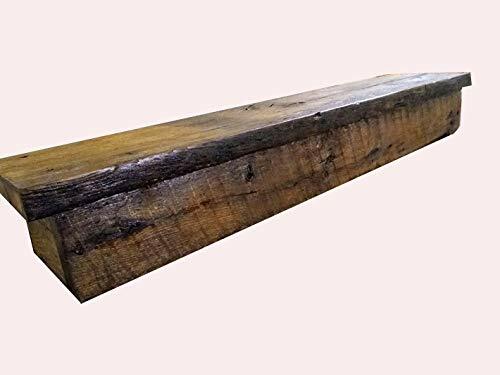 Returns: If you are unsatisfied with the barn beam mantel you receive, for any reason, it can be returned for a full refund. Request for refunds must be submitted within 7 days of receiving your reclaimed mantel. Warranty: This item may be returned for any reason within 7 days of receiving. Return shipping costs will be paid by the customer and shipping tracking information must be provided to the seller within 7 days to receive a refund. It's the first piece of furniture in any home. There's nothing as warm and welcoming as a crackling fire in an open fireplace. The dancing flames can lift your spirits and melt away the most stressful day in a matter of minutes. But to truly be part of the home, a fireplace must warm our hearts even when there is no fire in the grate. Pearl does not treat the mantel as trim or molding but as a beautiful piece of furniture that is the focal point of the entire room, the emotional core. It represents roots, Heritage and tradition. Furniture is arranged around it, precious treasures are displayed on it, and it provides balance and stability to the entire room. Pearl Mantels features fine furniture quality, stunning details and classic designs that will enhance any decor. The mike is truly a classic in all ways. This impressive piece has beautiful dimensional moldings that will frame your fireplace with grace and beauty for years to come. The mantel is made from medium density fiberboard, also known as MDF. MDF is a composite wood and is very commonly used for furniture, cabinetry, shelving and decorative moldings. Mantel ships in 3 pieces; 2 legs and 1 header. The legs attach easily to the header with nuts and bolts. Mitered hanger board assembly included for easy installation as well as a 3 piece mitered scribe molding set to hide any gaps after installation. This mantel has a 1 1/2 inch projection off of the wall leaving a nice pocket behind the mantel to accommodate your tile, stone, marble etc. Projection: 1 1/2 inch interior width: 48 inch interior height: 42 inch width outside leg to outside leg at base: 60 inch shelf length: 64 inch shelf depth: 7.87 inch leg depth: 3 inch overall height: 52.36 inch weight 52 pounds. Look for the pearl inlay that graces the right hand side of the shelf as proof that you have received an authentic pearl mantel. Paint grade only. Comes painted white and ready to hang or sand and prime and choose your own color. 495-60-70 Finish: Cherry Distressed, Shelf Length: 60" Features: -Mitered hanger board assembly included for easy installation. -Wood paint and stain grade. -For use in any room. -Not just for the hearth. -Home improvements - millwork and trim. -We suggest that pilot holes be drilled prior to inserting the appropriate hardware for final installation on the wall surface.. Product Type: -Shelf mantel. Primary Material: -Wood/Manufactured wood. Hearth Type: -Standard. Dimensions: Shelf Length 48" - Overall Height - Top to Bottom: -12". Shelf Length 48" - Overall Width - Side to Side: -48". Shelf Length 48" - Overall Depth - Front to Back: -9.5". Shelf Length 48" - Interior Surround Width: -31". Shelf Length 60" - Overall Height - Top to Bottom: -15". Shelf Length 60" - Overall Width - Side to Side: -60". Shelf Length 60" - Overall Depth - Front to Back: -10". Shelf Length 60" - Interior Surround Width: -40.5". Shelf Length 72" - Overall Height - Top to Bottom: -15". Shelf Length 72" - Overall Width - Side to Side: -72". Shelf Length 72" - Overall Depth - Front to Back: -10". Shelf Length 72" - Interior Surround Width: -52.5". 418-60 Finish: Unfinished, Shelf Length: 60" Features: -Mitered hanger board assembly included for easy installation. -Wood paint and stain grade. -For use in any room. -Not just for the hearth. -Home improvements - millwork and trim. -The Homestead collection. Product Type: -Shelf mantel. Finish: -Unfinished. Primary Material: -Wood/Manufactured wood. Hearth Type: -Standard. Finish Antique - Distressed: -Yes. Dimensions: -Bottom width: 50". -Weight capacity has not been tested. Shelf Length 60" - Overall Height - Top to Bottom: -5". Shelf Length 60" - Overall Width - Side to Side: -60". Shelf Length 72" - Overall Width - Side to Side: -72". Shelf Length 72" - Overall Depth - Front to Back: -10". AN EASY WAY TO DRESS UP PARTY FOR HALLOWEEN! -When it comes to Halloween party decor, you have many options of themes. Whether you re entertaining discerning adults or active children, the spiderweb Mantel scarf can help set the tone and ensure that your gathering is a huge hit. These Halloween fireplace scarfs are perfect for giving your house that spooky touch that it requires. It helps tie your Halloween decoration ideas together, creat you an impressive Halloween party. In addition to dressing up the fireplace and party tables, you can also take your entry way walk to a fresh new level. -This Halloween party decoration idea is so easy that even young kids can help you set it up. The black lace Mantel webbing matches all types of Halloween theme, and you can use them for some fun and creepy decor. You can also use them outside on your front porch, decorating walls, doors and entry way tables. It s a perfect way to greet your guests and help set the tone. -The 24-hour customer service s standing by, 30-day money back guarantee, 12-month replacement warranty, lifetime support guarantee. Choose VIVREAL, no risk. PERFECT ADDITION TO HALLOWEEN PARTY If you're doing some more serious entertaining, then you'll want to turn your focus to your fireplace, the dining table, or the entry way table for Halloween. This laser-cut webbing with spider shape will add an extra touch of creepiness for your Halloween party. Made of strong material, the spiderweb is durable and elegant. The scalloped edging and lace-cutting will definitely elevate your Halloween Party Decoration. MAKE YOUR HALLOWEEN PARTY UNFORHETTABLE Everybody will love these spiderweb fireplace Mantels. Spider element is a must in a Halloween party and this Mantel scarf is the easiest way to bring it in. Unfold and go up very easy, no wrinkles or anything that needs fixing. This is a nice accent to your Halloween decorations and creat creepy ambiance. YOUR SPOOKY AND CREATIVE DECORATIONS Start with a spiderweb decorated entry table is a nice idea of Halloween Party. Whether you have skulls, skeletons, scary ghosts and so on, the lace-cut spiderweb will help tie everything together, leave your guests an impressive Halloween Party. 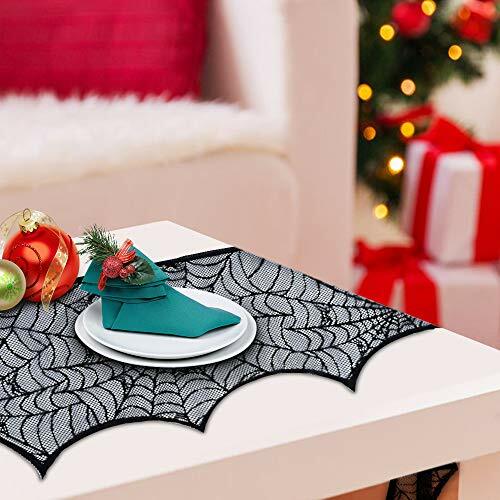 Delight your guests with a spiderweb decorated table, show the decorative function of the fireplace Mantel, you will make your own unique Halloween Party! FUN AND EASY HALLOWEEN DECORATIONS Use these spiderweb Mantel scarfs to decorate for your gathering, it will fit almost any themes, whether a cute theme for younger kids or a creepy theme focusing on leaving adults shivering. In addition, it helps you creat a safe and attractive environment where your guests are sure to have fun. YOUR INVESTMENT IS FULLY GUARANTEED We are confident that our Spiderweb Mantels are manufactured under strict quality standards to give our customers best experience. VIVREAL is a professional brand and we provide famouse after-sales service. For any problems, you can contact us and we will reply you immediately to solve all of your worries. In addition, we offer a FREE REPLACEMENT POLICY without any costs from your side and 12 MONTHS WARRANTY, totally no risk for you! Warranty: This halloween party decor mantel scarf is warranted against defective material or workmanship for a period of 12 months from the date of purchase. Any defective part will be, at the discretion of vivreal, repaired or replaced at no charge if the appliance has not been tampered with and has been used according to these printed directions. If you have any questions on our product, please email support@vivreal. Com. These barnwood mantels are made from 2" thick authentic reclaimed wood. Each mantel has it is own unique rustic character from years of use. This is a very solid 2" thick box beam style mantel. They are available with an 8" or 10" deep shelf in 4,5,6,7ft lenths. A 2x4 mounting cleat is included making it very easy to mount to any surface.